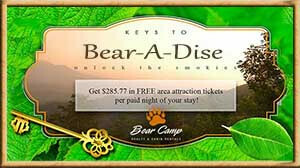 (New Listing) Big Bear Lodge - Bear Camp Cabin Rentals. "Big Bear Lodge" is the perfect cabin for large gatherings, weddings, and family reunions. This gorgeous custom built all wood log cabin is 5800 square feet and beautifully decorated. It is located in beautiful Wears Valley and is approximately 10 minutes from Townsend, 15 minutes from Pigeon Forge, Dollywood , Splash Country and 25 minutes from Gatlinburg. There are paved, and at times curvy and steep mountain roads all the way to the cabin until you reach the driveway which is gravel. This cabin is not motorcycle friendly. The parking area will accommodate 5 vehicles comfortably. This cabin also offers pool access and a catch and release fishing pond at Honeysuckle Meadows Deli and Pool, approximately 5 minutes from the cabin. With only 2 steps to enter this stunning cabin, when you do you will be amazed by the spacious floor plan, beautiful decor, all the wood interior, and by all the amenities the cabin has to offer. This 6 bedroom 4.5 bathroom 3 level cabin will sleep 18 and is semi-private. On the main level floor, you will have a very spacious living room with high vaulted ceilings and plenty of seating to spend time with family and friends. Kick back and relax on the sleeper sofa or reclining couch while watching your favorite show or play Nintendo 64 on the Flat screen TV or curl up with a comfy blanket in front of the large stacked stone gas fireplace. Adjacent to the living room is the beautiful spacious fully equipped kitchen with dining for 8 and additional seating for 4 at the island. Just off the kitchen is a large laundry room with a washer and dryer for your convenience. Also located on this level is the Master King size bedroom, a private bathroom with a walk-in shower, a relaxing chaise lounge surrounded by windows to enjoy the wooded setting while enjoying one of the books from the fully stocked bookshelf. On the upper level, you will find 2 additional bedrooms and an NHL hockey dome game on the landing. With one of the bedrooms having 2 King size beds, a foosball table and a Wii gaming system for the Flat screen TV to keep the kids or kids at heart entertained during your stay. The other bedroom will have a Queen size bed, a private bathroom with a tub/shower combination, and a Flat screen TV. On the lower level, you will find 3 additional bedrooms. One bedroom will have a King size bed, a Jack and Jill bathroom with a tub/shower combination and a Flat screen TV. In the 2nd bedroom you will have a Queen size bed, a Flat screen TV, and it will have access to the Jack and Jill bathroom. In the 3rd bedroom you will find a Queen size bed, a Flat screen TV, a private bathroom with a walk-in shower, and a sleeper sofa. Also, located on this level is the large well-stocked game room. With a pool table for the pool sharks, a shuffleboard game, PlayStation 4 and a Flat screen TV. "Big Bear Lodge" has 2 large spacious decks with plenty of rocking chairs and outdoor furniture to enjoy your morning coffee or swing in the porch swing while taking in the nature around you. There is a gas grill on the main level deck for you to grill your favorite food and have a cookout with your family and friends. Enjoy the screened in porch while enjoying the food you grilled or just hanging out and catching up on memories. The lower level deck holds 2 hot tubs for your enjoyment. After a long day of sightseeing or hiking, climb in and soak all your cares away in one of the bubbly hot tubs. If you are looking for a relaxing and peaceful vacation to spend time with family and friends, then look no farther than "Big Bear Lodge" for your next mountain vacation. This luxurious, spacious cabin is tucked away in the mountains, but convenient to all the area attractions. What are you waiting for? Book this beautiful 6 bedroom custom built log cabin today!!! Great Smoky Mountains Heritage Center, Smoky Mountain Alpine Coaster, Cades Cove, Hatfield and McCoy Dinner Show, Comedy Barn Theater, access to hiking trails, The Titanic Museum. Our family had a great week. The lodge was beautiful. Cabin was very nice, plenty of room for 11 people, and lots of nice amenities. Enjoyed all the decks, hot tubs, and semi-seclusion. Did great. A very good location plenty of space with good solitude. I Recommend this place for large groups. Check in and out was a breeze with all information needed.